I can't believe this rain, it doesn't want to stop. We escaped the pounding of water received by much of Saskatchewan and southern Alberta earlier this summer, instead watching from a distance and appreciating our northern perch, sunny, temperate, perfect. But, as SummersEnd Friday turned into Saturday, rain clouds were approaching. Tim Hus was on stage, warming up the crowd for one of the greatest Canadians, Stompin' Tom Connors, as the black (and I mean black black) clouds swirled to the north, lightening bolts cutting through the sky every few minutes. MacDonald Island Park CEO Tim Reid was on the phone with concert promoter Kenny Hess discussing options should the storm park itself above the concert site. The light rain became heavy as Connors came from stage right, his requisite piece of plywood in hand, ready to stomp it out in Fort McMurray. 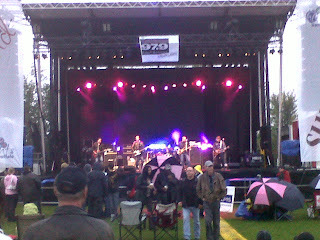 The concert went on as the water fell and the electrical storm moved on and out. Umbrellas peppered the reserve seats in front of the stage and makeshift canopies started appearing on the VIP sections on both sides of the site. The rain kept falling, harder, more insistent. I lasted a couple of songs before going home, shocked at the number of people still lined up shoulder to shoulder, waiting to try the more popular rides in the Blueberry Midway. Rain or no rain, the midway was here, and people were going to soak in every minute. That was Saturday night. The rain continued through much of Sunday, the finals of the Shell DanceXplosion, Barney Bentall & the Legendary Hearts, April Wine and more midway rides. It reappeared on Labour Day Monday, pelting Wood Buffalo as the line for the rides continued at SummersEnd. I love the headline for the news release that went to local media late last night from organizers, Events Wood Buffalo: SummersEnd 2010 Wet and Wild - a most perfect description for a weekend of fun.